Imagine a well-preserved collection of vintage clothing dating back centuries for students to study in connection with not only textiles but sociology, history and other academic disciplines. MTSU students don’t have to imagine it, because it exists in the McWherter Learning Resources Center and online at the James E. Walker Library’s Digital Scholarship Initiatives webpage. More than 750 items, representing styles from 1790 to 1990, are kept in a climate-controlled lab at the LRC, and nearly 400 have been captured online for the library’s Historic Clothing Collection, searchable by title, garment, fabric or era. Dr. Teresa King, a professor in the Textiles, Merchandising and Design Program, began collecting the fashions and the acid-free boxes and paper to protect them as a labor of love, partnering with community groups like Oaklands Mansion and Belle Meade Mansion and gathering donations from the public. “When people have things in their attics and their basements and don’t know what to do with them anymore, they oftentimes come our way, and we have some lovely stories that go with them,” King said. For example, Peggy Goldstein Leftwich, a member of the prominent family of Murfreesboro department and jewelry store owners and businesspeople, donated a blue and green taffeta gown worn to President John F. Kennedy’s 1961 inaugural ball. A suit from the late 1800s that once belonged to Jack Daniels’ sister also is part of the collection. Another couple insisted on donating the husband’s World War II uniform in person. Senior Rachael Krasnow of Murfreesboro and several student assistants documented as much information about each garment as possible and positioned each garment so that Krasnow, formerly a full-time photographer, could take photos. Krasnow, a Textiles, Merchandising and Design Program major, admits that some of her fellow students consider her out of step with contemporary fashion because of her love of vintage styles. The Historic Clothing Collection is supported by the Department of Human Sciences and a digital seed grant from Walker Library. You can view the virtual collection here. 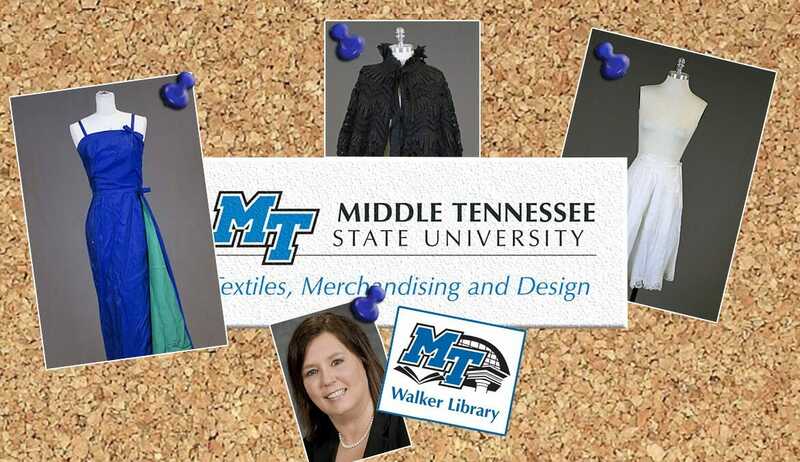 For more information about the historic fashion collection, contact King at 615-898-2156 or teresa.king@mtsu.edu. To learn more about the library’s digital collections, visit http://dsi.mtsu.edu/about or send an email to digitalscholar@mtsu.edu.